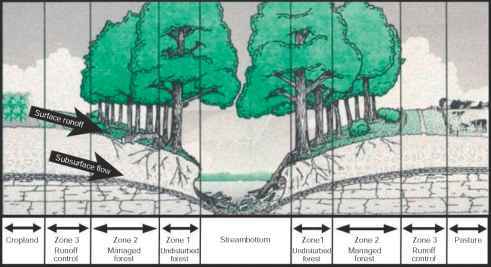 Agroforestry systems have the potential to sequester substantial quantities of carbon (C). In addition to seques tering C in biomass and soil, these systems can contribute to both carbon conservation (conservation of carbon stocks in forests by alleviating the pressure) and carbon substitution (reducing fossil fuel burning by producing fuel wood). In temperate regions, agroforestry practices have been estimated to have the potential to store C in the range of 15-198 MgC ha 1 (mode: 34MgC ha J).The C sequestration potential of agriculture in the USA through the application of agroforestry practices by 2025 is estimated as 90.3 Tg C yr 1 (Tg 1012 g million tons). In the tropics, agroforestry systems are estimated to have helped to regain 35% of the original C stock of the cleared forest, compared to only 12% by croplands and pastures. It has been estimated that an increase of 1 ton (Mg) of soil carbon pool of degraded cropland soils may increase crop yields by 20—40 kg ha . A projection of C stocks for smallholder agroforestry systems indicates C sequestration rates ranging from 1.5 to 3.5 Mg C ha 1 yr 1 and a tripling of C stocks in a 20 year period, to 70 MgC ha \ Global deforestation, which is estimated to occur at the rate of 17 million ha yr 1, is expected to cause the emission of 1.6PgCha 1 yr 1 (Pg 1015g billion tons). Global warming is now accepted as a real issue the world over. Ways of reducing CO2 in the atmosphere will undoubtedly be receiving increasing attention in the future. More than twice as much carbon is held in soils as in vegetation or the atmosphere; changes in soil carbon can have a large effect on the global carbon budget. Assuming that 1 ha of agroforestry could save 5 ha from deforestation, carbon emission caused by deforestation could be reduced substantially by establishing agroforestry systems. Along with these efforts, carbon markets will become stronger and more active. The opportunity offered by agroforestry systems to sequester carbon and market it for real money is real, even in poor countries.